Personalized Handmade wedding puzzle guest books & designs at amazing value for weddings, anniversaries, birthdays, and special occasions. Receive a Free Custom Engraved Sign & Stand, the correct Pen for signing, & Stamping on each piece with your puzzle purchase. Prompt Customer Care – Have a question? We will answer it, call us with questions, creative puzzle ideas, or Rush Order inquires. Elegantly hand cut wedding puzzles. Featuring accent colors, your images, & custom figure pieces. Precisely laser cut wedding puzzles. Featuring unlimited font options, theme graphics, & symetrical design. We strive to inspire new clients through past and present designs. A variety of designs may be found within The Puzzle Store and Our Journal. The handmade wedding guest book puzzles that we create work well with high contrast, vividly colored images, as well as bold artwork. Some of the most creative artwork that we have seen has been in the form of photography from various artists around the world. We also carry a selection of engraved wedding puzzle designs that can be customized for a variety of occasions. At times our clients prefer to design their own wedding guest book puzzle. Which is awesome and we welcome all new ideas and input! Based upon those ideas the puzzle design is tailored to the clients specifications. It starts with a discussion of design concepts between the both of us, including customized cut-outs. From there we determine what will work best for your wedding puzzle guest book or custom wood jigsaw puzzle. Then we generate a proof based upon our conversations. I Have a Design Idea! We invite you to step into our world of sawdust and create something beautiful! From our perspective, people are placing greater value on handmade goods, which are coming from private makers all over the globe. Today we could be designing a wedding puzzle guest book and tomorrow we could be laying out cuts for a piece of custom furniture. Sometimes it gets messy! 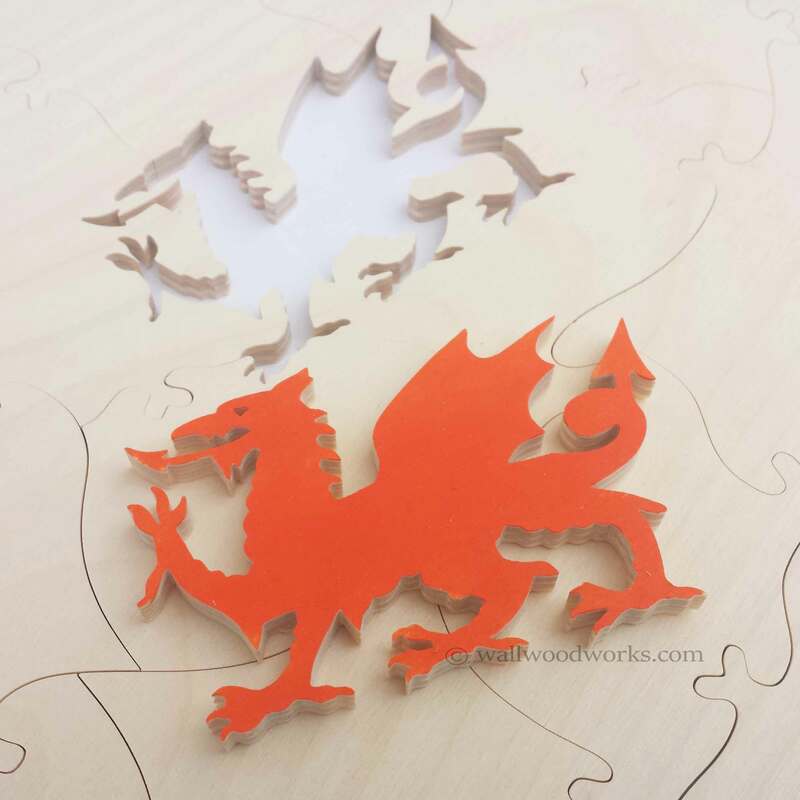 Recently we added the precision and accuracy of laser engraving to highlight the handmade aspects of our puzzles. An individually designed and handcrafted wedding puzzle guest book is an alternative guestbook idea. From Inspiration, to Design, to puzzle Creation it is a highly creative process. One of the best sources of information for a wedding puzzle design we have found is the couples story. Everyone has a story! We assist in telling your story within a wedding puzzle. We are able to take certain details for example your favorite sports teams, how you met each other, your pets, your pet’s names, hobbies, interests and turn those details into carved out figure pieces. Once your wedding day is complete and all of the pieces are signed you will have a keepsake that will last many years to come. In addition you will have a conversation piece that is frame-able. Each wedding puzzle is a joint design process between us and our clients. We enjoy coming up with new wedding ideas for each bride. Having over 15 years of experience with assisting client designs and customer service is a benefit. We are easy to talk to and good listeners feel free to share your ideas with us or call us directly. 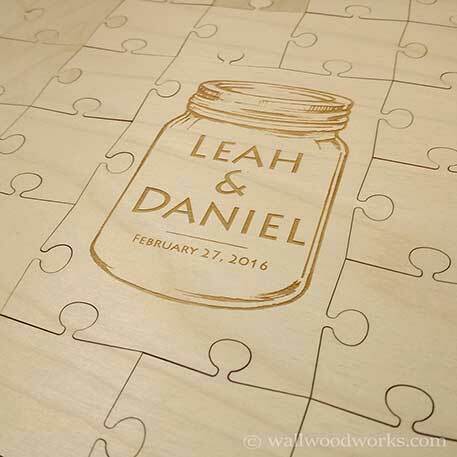 A wedding puzzle guest book is an alternative wedding idea that combines creativity with the whimsical world of wood jigsaw puzzles. We make these wedding puzzle guest books in a variety of shapes and styles. A few of the our client favorites are Tree Wedding Puzzle Guest Books, Engraved Wedding Puzzles, as well as Photo Wedding Puzzle Guest Books. You can also combine any of the ideas found on this site and make your own puzzle idea.